Keeping the kitchen hygienically clean and well organised requires a lot of effort and maintenance on a daily basis. Most people will have a variety of cleaning stuff for the kitchen from washing up liquid to cleaning cloths. I’m sure most of us probably leave all these everyday essentials on our window sills or by the sink for convenience but it ends up looking messy. This clutter can easily be cleared and organised into one of the following 5 best kitchen sink tidy caddy. Many households probably use some sort of box to keep all the sink and cleaning essentials into but it’s a bit of an eyesore when there’s so many things inside. Having separated sections makes it easier for you to organise all your kitchen sink cleaning stuff from sponges to washing up liquid. 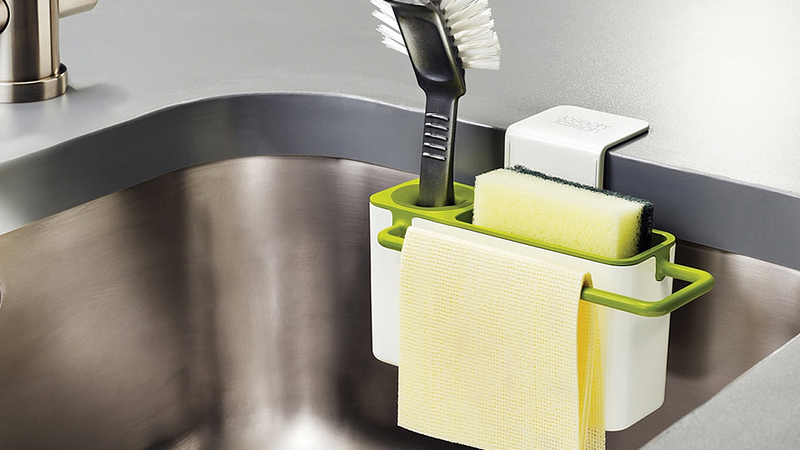 Not only does it look tidy but it also makes reaching for items convenient when washing up. 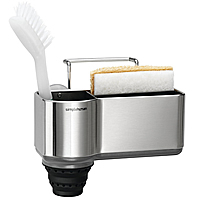 Ideally, if the dividers separating the compartments can be removed, this makes cleaning the sink caddy a lot easier too. To prevent water leakage from cleaning cloths and sponges from dripping onto your sink countertop, look for a caddy that has a removable drip base to catch leaks. Being able to remove the drip base makes it easier to pour the water out and for ease of cleaning. You’ll find that leaving leaked water in the base of your sink caddy leads to limescale and a buildup of grime. It makes your cleaning stuff dirty and unhygienic and you end up wiping that over dishes and surfaces. If things are left to dry without ventilation holes, the items end up smelling terrible and probably full of bacteria and germs. Mould spores will form as well. The best kitchen sink tidies will have perforated holes at the bottom and side to allow air through so wet sponges and cloths can be allowed to dry properly. 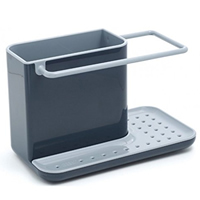 A kitchen caddy tidy would usually be made of plastic materials which is most ideal due to the fact that it’s more likely to last a longer time. However there are some that are made from stainless steel with claims of being rustproof. Inevitably, it will rust and you end up getting bits of this on cleaning cloths and sponges so it’s best to opt for ones made of rubber or plastic. 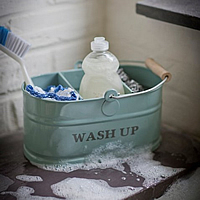 A kitchen sink tidy caddy helps to organise and maintain good hygiene around your sink area. A factor that’s usually not considered by many people but in fact, is actually an important one. Washing up liquid will stay in fine despite the height but that’s due to it’s wide flat base. However, long handled tools don’t have that so it won’t stay in so there should be a compartment with a higher height to keep these items upright. Many of the best kitchen sink tidies are designed with a slant going downwards to make it ideal for holding in different sized sink cleaning accessories. 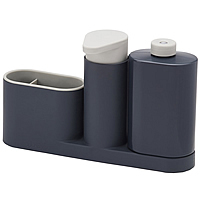 Don’t opt for a large kitchen caddy tidy when you have a small kitchen. In general, a sink caddy is supposed to be a space saving solution for the kitchen so why would you get a big one that takes up too much space? 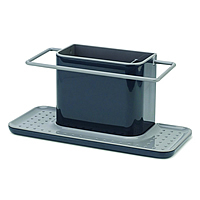 Basic kitchen caddies are usually big enough to fit a few cleaning essentials in which is suitable for any household. 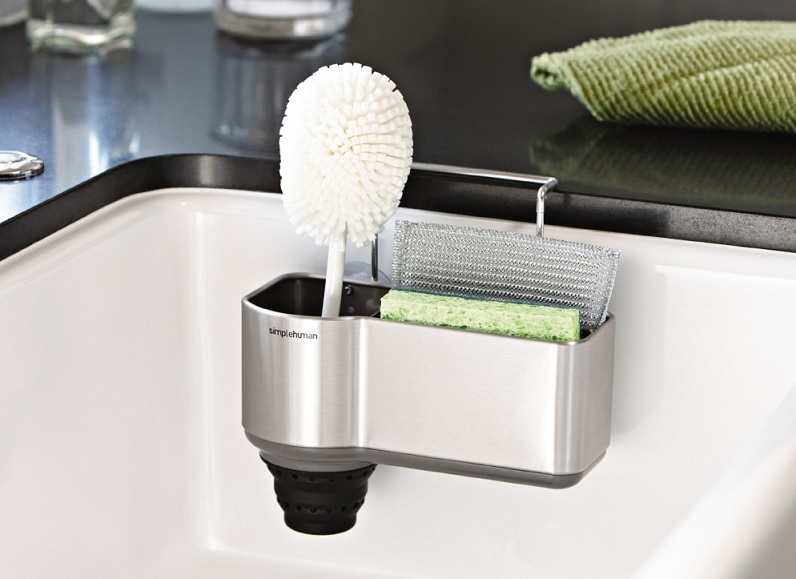 Some sink tidies are designed with 4 walls to hold everything in which is ideal when you only have a few cleaning essentials like the sponge and washing up liquid. However, there are also ones that have an open design which usually consists of a pot for cleaning tools and a dish for cloths and sponges. This may be more suitable for a kitchen with more cleaning stuff as the open design allow the items to dry quicker. With plenty of well designed kitchen sink caddy designs available on the market, it shouldn’t be too hard to find the best kitchen sink tidy to fit in with your kitchen design ideas.